Me? Blog Hop? Yes please! 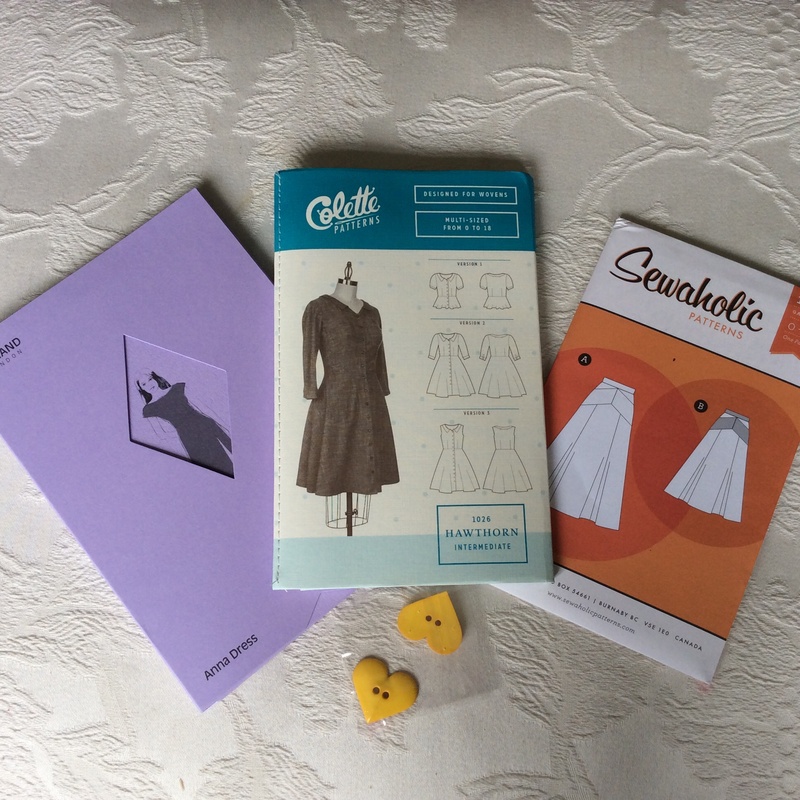 For the last few weeks I have been reading, with interest, various sewing blog hops where people answer a varying range of questions about their sewing/blogging/inspiration etc. It was therefore incredibly surprising, that this fledgling blogger (with only eleven posts to her name and an even fewer number of followers) was nominated. So huge thanks to Rachel from Is it fitting for thinking that I might have something of interest to say – Here goes . . . . . Why do I write? I have always liked writing. I like the permanence of the written word – particularly from a social and historical contextual point of view. I find writings from women of the past fascinating. 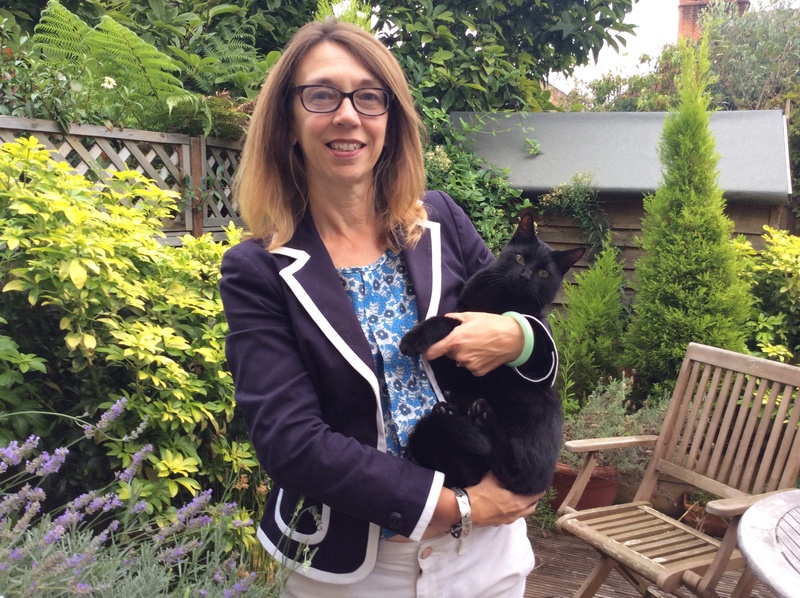 I have been both a diary keeper and a letter writer – I guess that I am just moving with the times, albeit a little after everyone else, and now blogging. 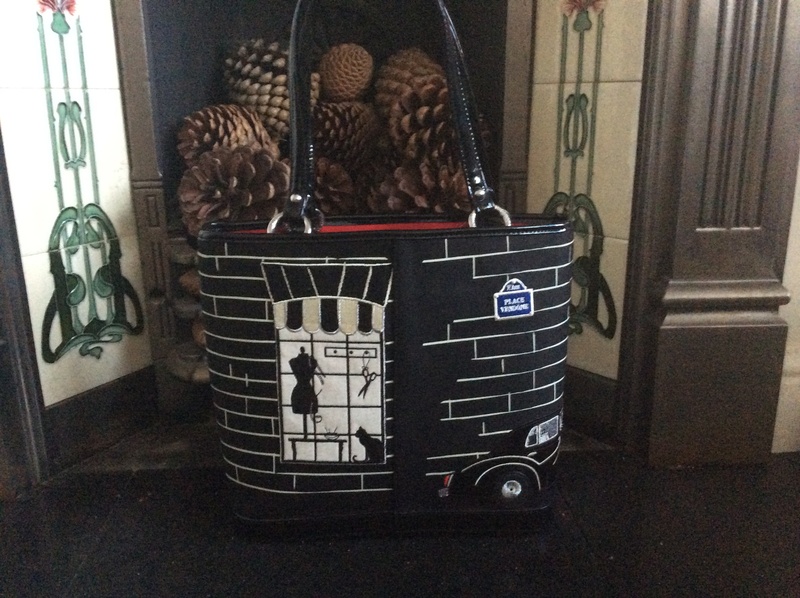 Years ago Virginia Woolf wrote about the importance of A Room of One’s Own – the desire is just as important today and it is with great interest and pleasure I have read about various bloggers’ sewing spaces and how precious they are to them. What am I working on at the moment? I am still in the September return to school flurry and have not completed any projects this month but I have started loads! 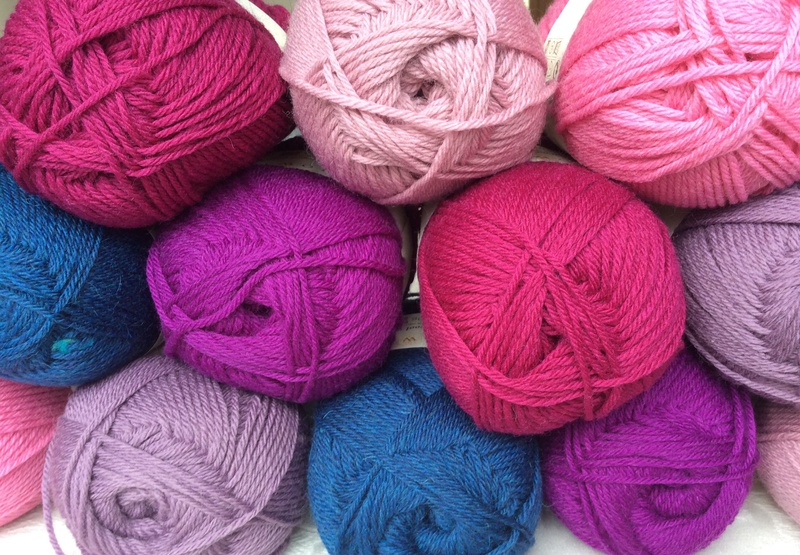 I tend to sew at weekends and knit during the week which is more manageable on my commute. I have started knitting a patchwork blanket designed by Martin Storey as a knit-along for Rowan. On the sewing table is a dress from Love at First Stitch (cut out and ready to sew), a yoke top from Learn to Sew with Lauren (cut out from the most gorgeous silk I bought in China this summer) and I am determined to make Fehrtrade’s VNA top for the Chichester Half Marathon which I am running on October 12th. How does your blog differ from other blogs? It’s obvious isn’t it? I’m new, don’t really know what I am doing, can’t easily add buttons, icons, etc. take rubbish photos (or rather my willing students take them) and haven’t really established my own style yet. I am working on that and hopefully by the time I celebrate my first blogiversary I will look back fondly (and with some embarrassment) at these early, juvenile posts. How does my writing process work? I am a runner. Whilst I am out I go through all sorts of things in my head: letters of complaint; job applications; blog posts. 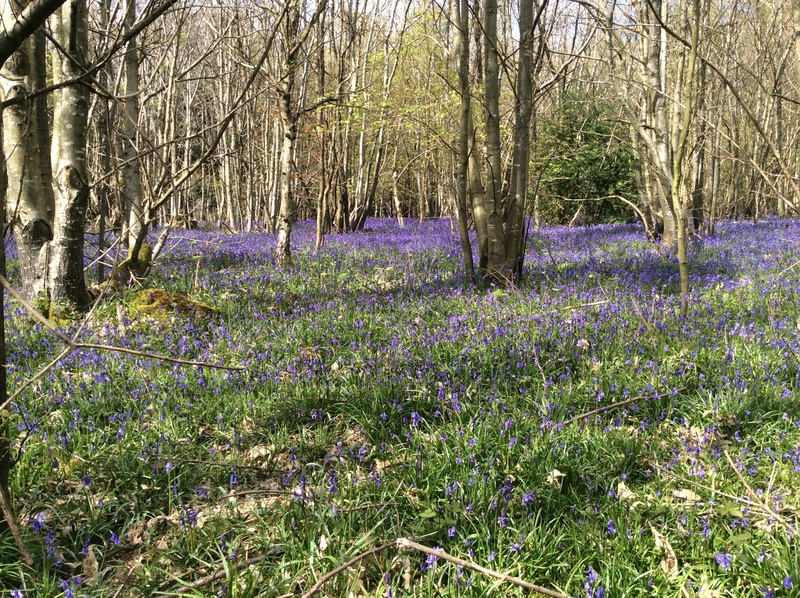 I can assure you that somewhere on the South Downs are crafted the most amazing, original and entertaining blogposts. Bizarrely, by the time I have got home, showered, done a million and one other things, all the little gems have vanished and what remains is what you can read here. 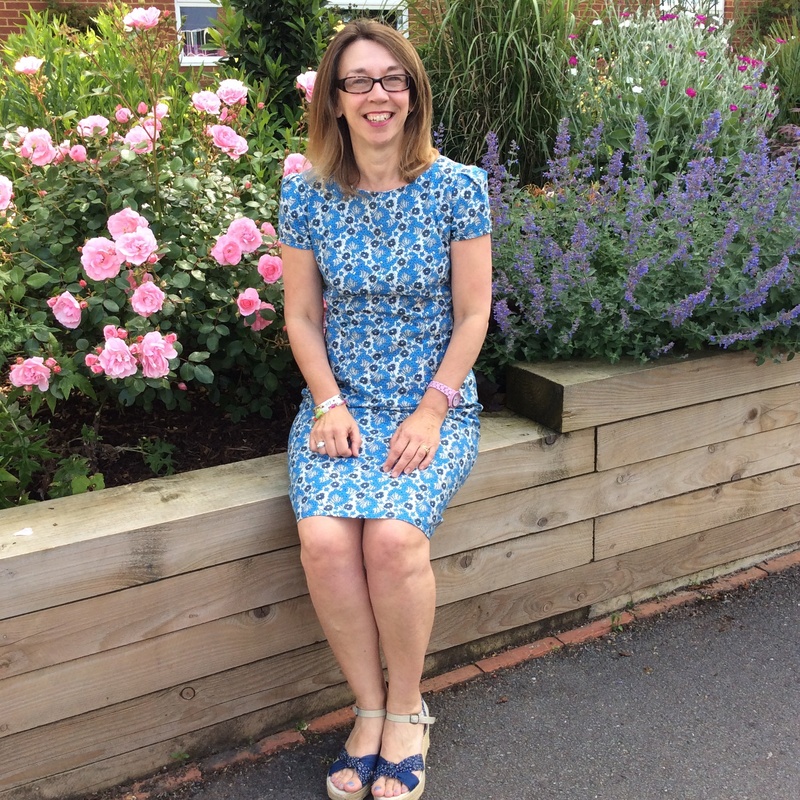 I am ridiculously proud of this dress – a colleague actually asked me “Is your dress from White Stuff?” However, looking at the photos (courtesy of one of my Y10 – I really am going to have to investigate the decent camera and tripod option) it does appear to be a little bit baggy across the top. 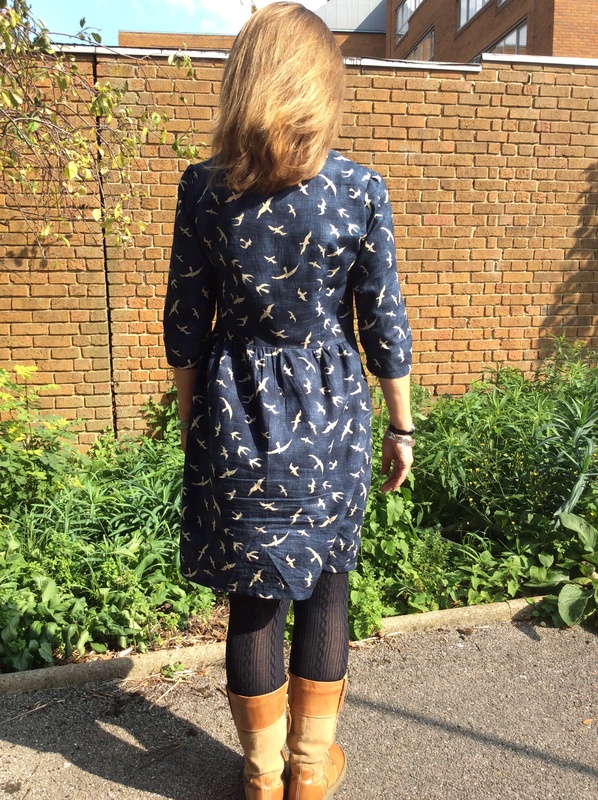 This is my first Deer and Doe pattern and the Sureau was really lovely to sew. I particularly like the false placket (five months ago I didn’t even know what a placket was). By the way, do you like my necklace? It is a treasured possession of mine. 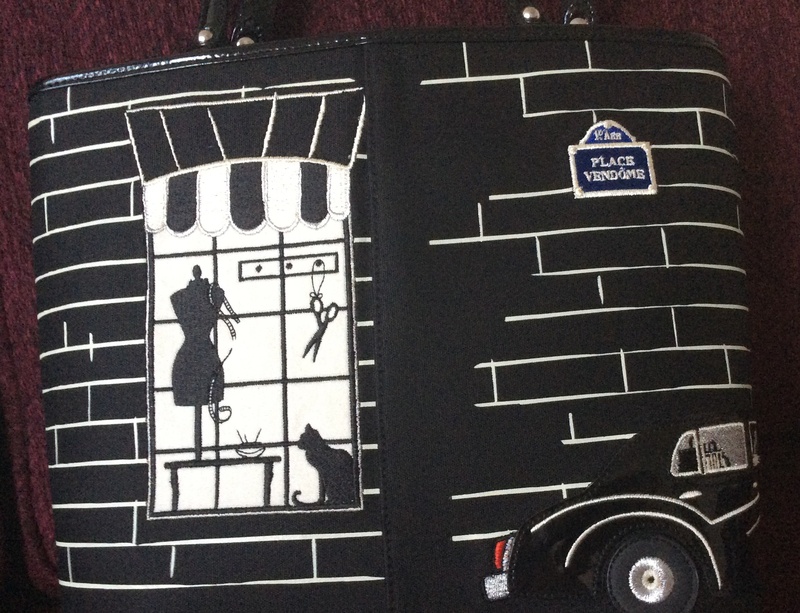 It belonged to my mum – there is a matching bracelet. It was given to her in the early 1950s and apparently came from Austria. 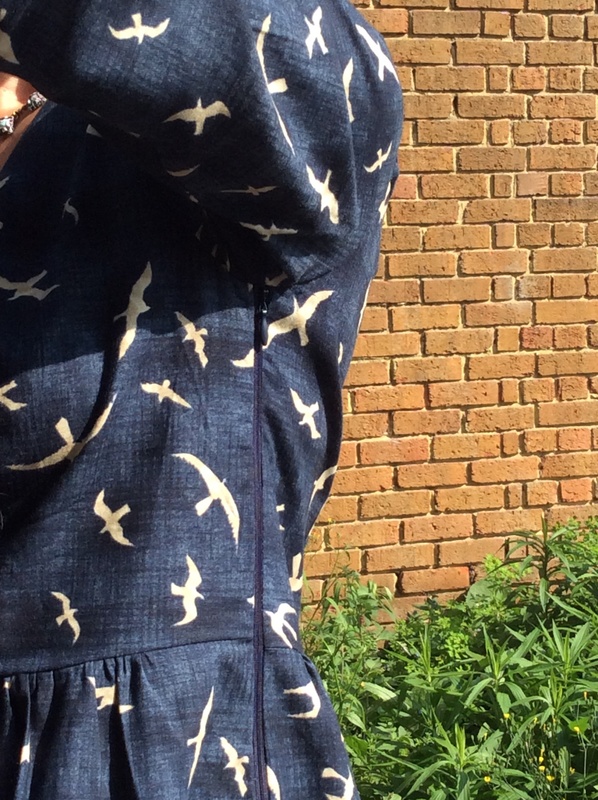 I followed the really helpful Sew-a-long on :: paunnet :: including clear instructions for a SBA – it’s apparent from the photos that I could have taken off even more but I was obviously in denial about quite how small my bust is! I was also pleased to have learned how to insert a side zip. 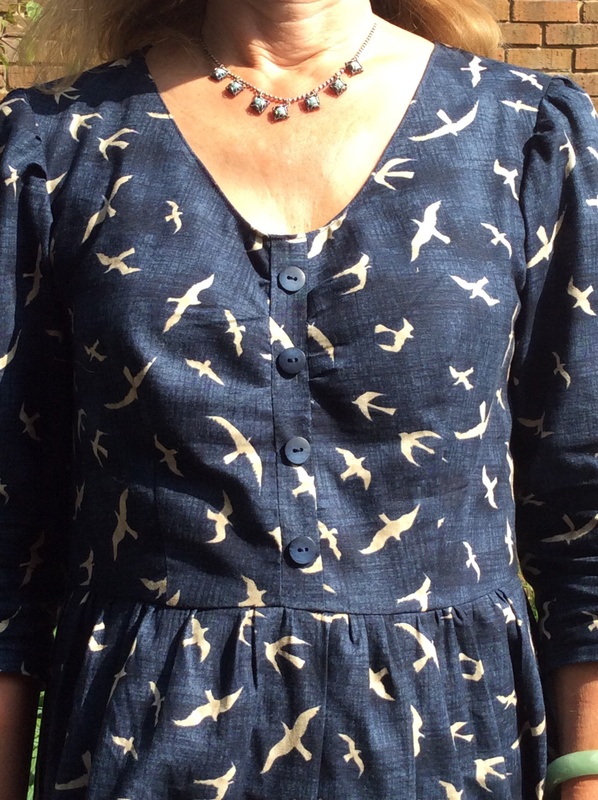 It is incredibly satisfying to learn new things and whilst I haven’t been sewing for long I can see that there are so many techniques to learn and the perfect that I am going to be happily ensconced at my machine for hours. The obligatory back shot – the dress is quite rumpled because I had been perched atop my desk for most of the morning. Sorry about the uninspiring background i.e. the flats which overlook the school – we do have lovely grounds but both I and my willing photographer felt a little self-conscious so snuck around the back of a teaching block to take these shots. Well, I love this dress and plan to make a couple more. It is wonderfully comfortable and will lend itself to layering as the season rolls on. 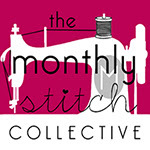 I am going to try and find some needle cord for the next one – any fabric suggestions for me? Enjoy the day – hopefully another one of those gorgeous late summer days that make you feel you have to savour every moment. Dressing for the occasion . . . . . And the occasion is KATE BUSH! 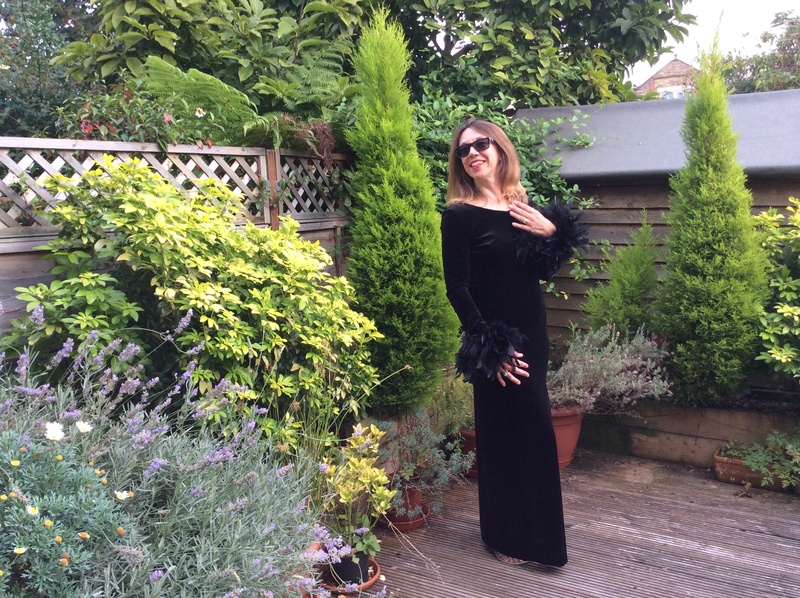 Hello, I did give myself the option to not always blog about my sewing and this post is my first deviation so please forgive me if you were only wanting to hear about my dressmaking – this one is costume related if that is any consolation. 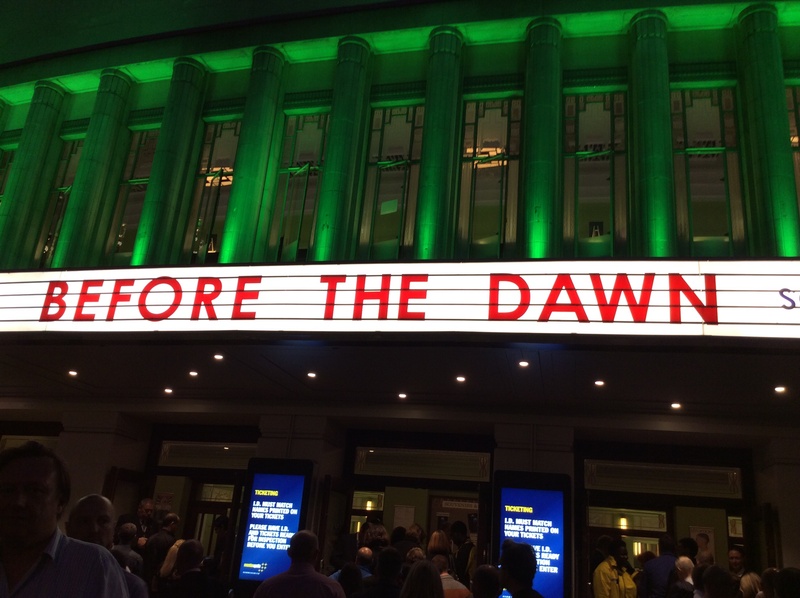 Last night I went to see Kate Bush. I was ridiculously excited and thought it was only right and proper that I dress up for the occasion. 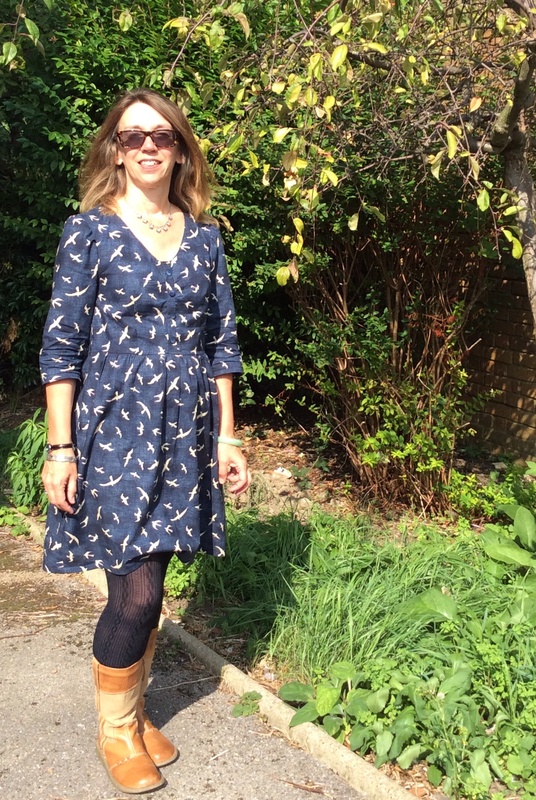 A few weeks ago I came across this glorious dress in a vintage fair in Chichester Assembly Rooms – you can’t see it in the photos but it has a thigh high slash and a plunging back. The feather covered cuffs were great fun. Just look at how I am shoving out my chest to try and fill the dress (the design meant I had to go braless which is never going to be a good look for someone like me). 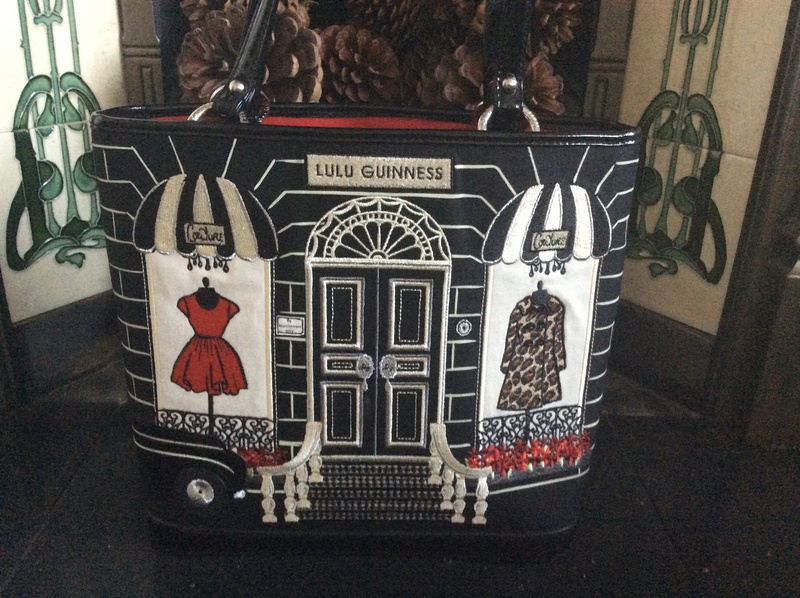 I accessorised the dress with a bag bought for me by dear friends for a big birthday – it is a great bag with embroidery depicting a couture dress shop and the reverse showing dress form, scissors, pincushion etc The concert … It was magical! I have loved Kate since Wuthering Heights. I found it so emotional at the start of the concert that as soon as she started singing I had tears rolling down my face. I am becoming increasingly nostalgic as I get older and feel so privileged to have lived through such brilliant times. I was sat next to a fan from Sweden who had come over just for the concert. She said it was a 30th birthday present to herself – she wasn’t even born when when Kate Bush started recording. There are no photos of the event ( the guy in front of me was removed for taking pictures). 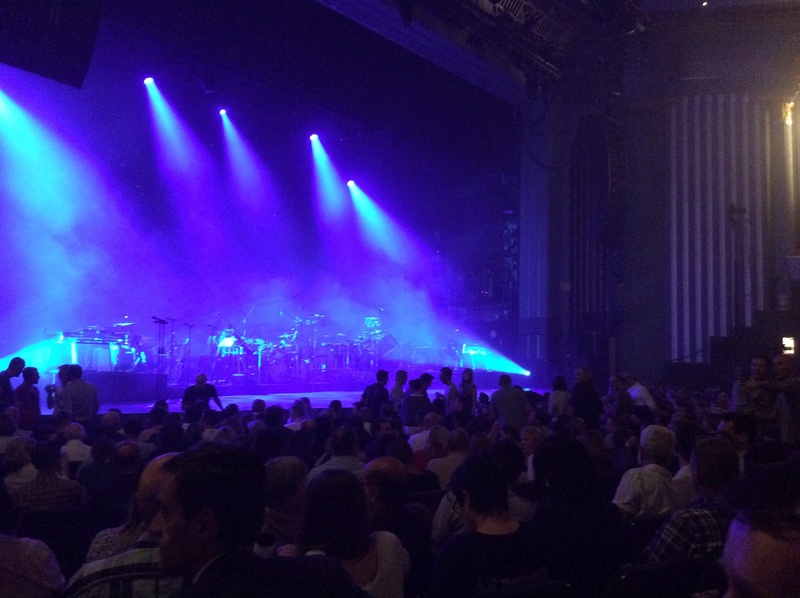 The stage shot is from before it started. 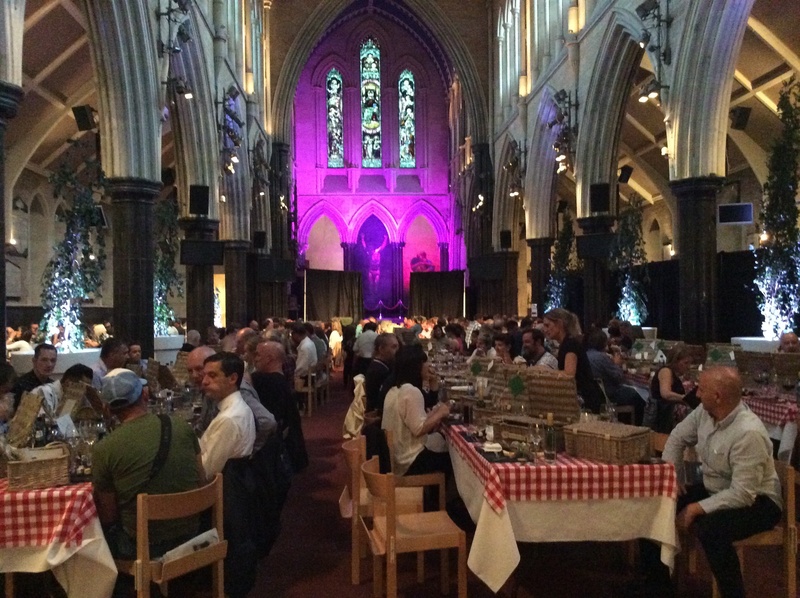 I went to a “sumptuous picnic” beforehand in the gloriously gothic setting of the church opposite – it was the only way I could get a ticket – by buying a ridiculously expensive hospitality package. However, the food was gorgeous. 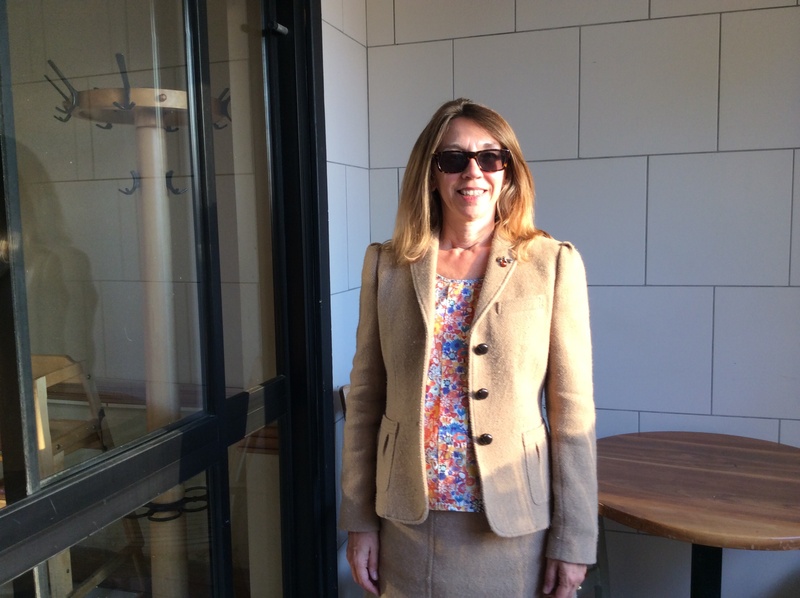 I really enjoyed dressing up for this event – clothes have the power to make us feel magical. However, I think the Chelsea supporters I encountered on the District Line thought me more than a little eccentric! 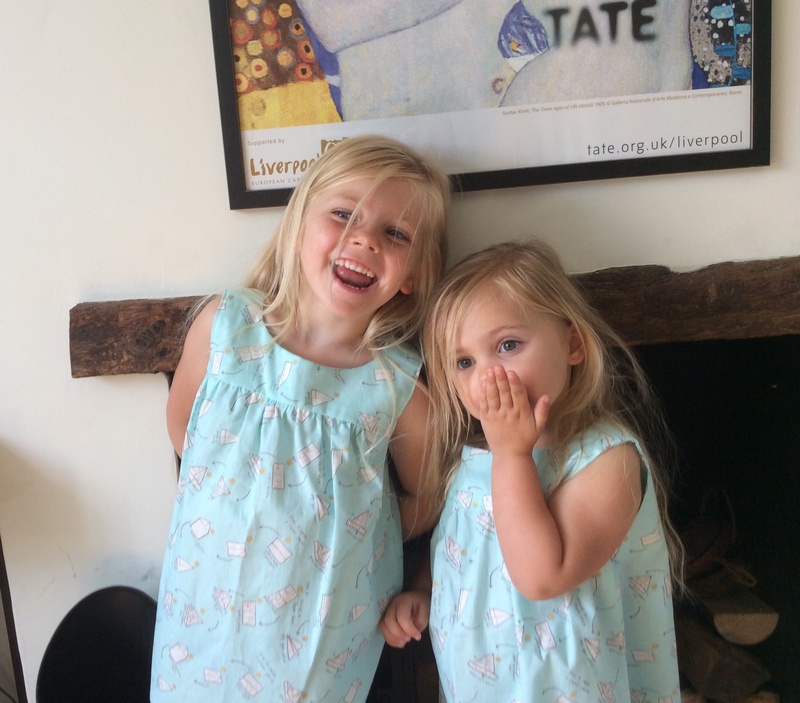 I promise a sewing post for the weekend – my Sureau! 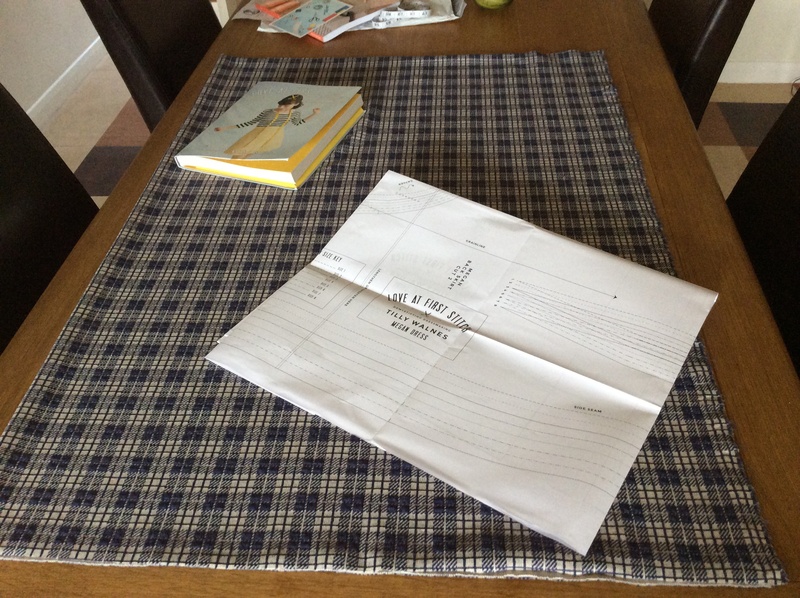 One Week One Pattern: I have joined the sewing community – Yay! Since I first saw the details of OWOP I have been excited. 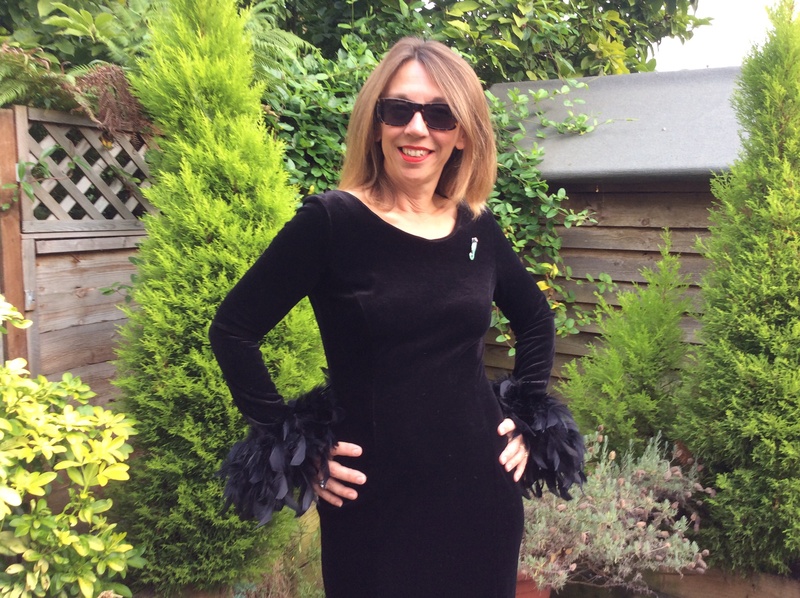 Having bought my sewing machine at Easter and having started to follow blogs soon after I have wanted to join in and be part of something friendly, exciting and it must be said ….. sassy. 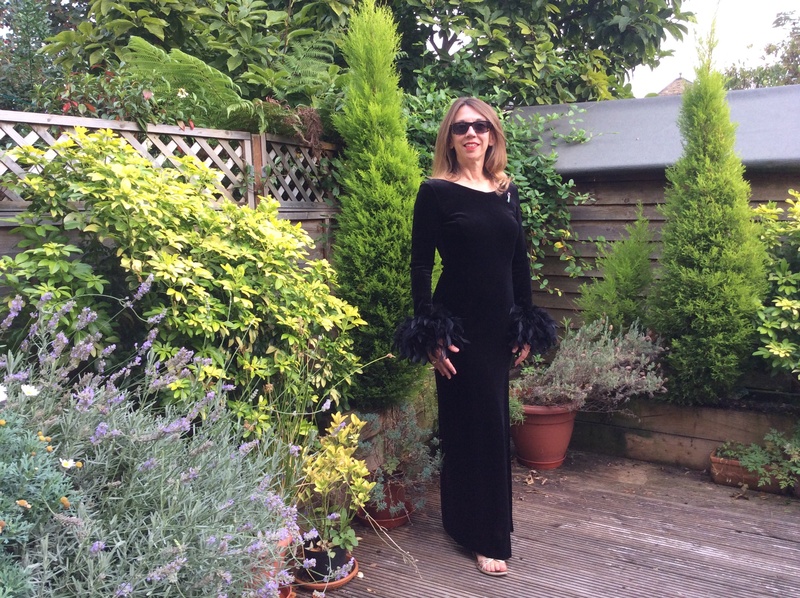 Having seen all the amazing clothes which featured in Me-Made-May I was eagerly looking forward to next May and then, ta dah, along comes news about OWOP14. I knew straight away it would have to be the Sorbetto so here is my round-up. A sunny Saturday at home and I wore my first ever Sorbetto. I made this with fabric left over from a dress. In fact, most of my Sorbettos have come from left over fabric – that is one thing I have discovered, pattern instructions appear to be very generous in terms of fabric requirements. 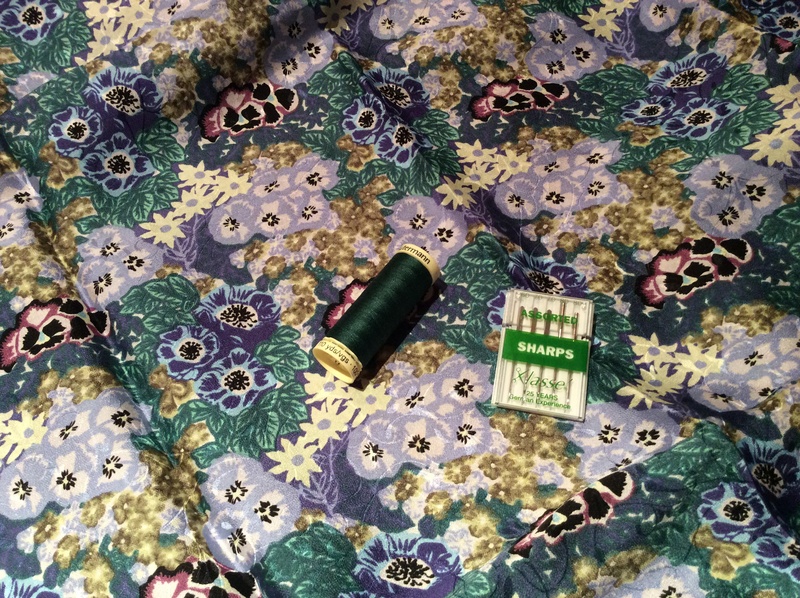 This fabric is supposed to be retro funky – it looks OK as a top but as a dress, it just looked too frumpy. The skill I learned making this top was how to make my own bias binding and how to attach it – I have The Little Tailoress to thank for this. Her instructions are so clear and her blog just oozes with gorgeous quintesentional English Rose beauty. I wore the top with jeans for a relaxed weekend feel. 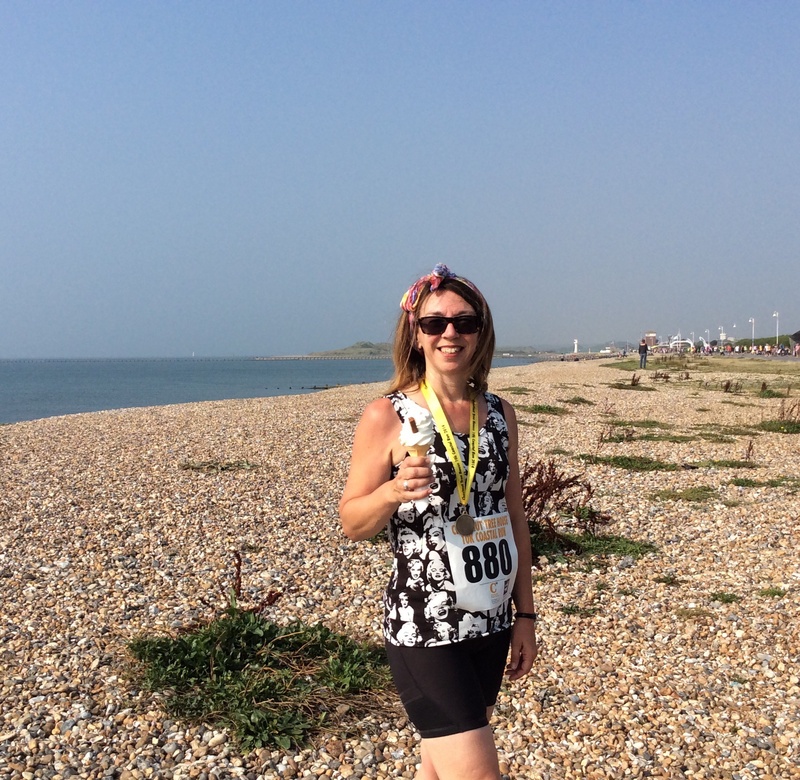 A fantastic late summer day and a 10K race along the seafront for me. I wore a sorbetto, minus the front pleat and with three inches additional length, as a running top. This was leftover fabric from my first Moneta (and my first jersey knit). I think this could be my favourite Sorbetto – it certainly gets some glances. At work today so I had to look a little more formal. I made this Sorbetto to wear when I sang WW1 songs with a pop-up choir. Whilst I love red to look at, it’s not a colour I regularly wear so I had to rootle around for something to match it with. To be honest, I am not really happy with this look – it isn’t quite my style. I have started to realise the depths of pleasure experienced when someone says they like what you are wearing. It happened today when I was in the bank. To be honest, I’m not really keen on this one so was doubly surprised. Photo credit to one of my Y9 students who took the picture for me – very bemused. Used ready made bias binding for this Sorbetto made with leftover fabric from a Lilou dress. As previously I added three inches to the bottom and a couple of lemon buttons. 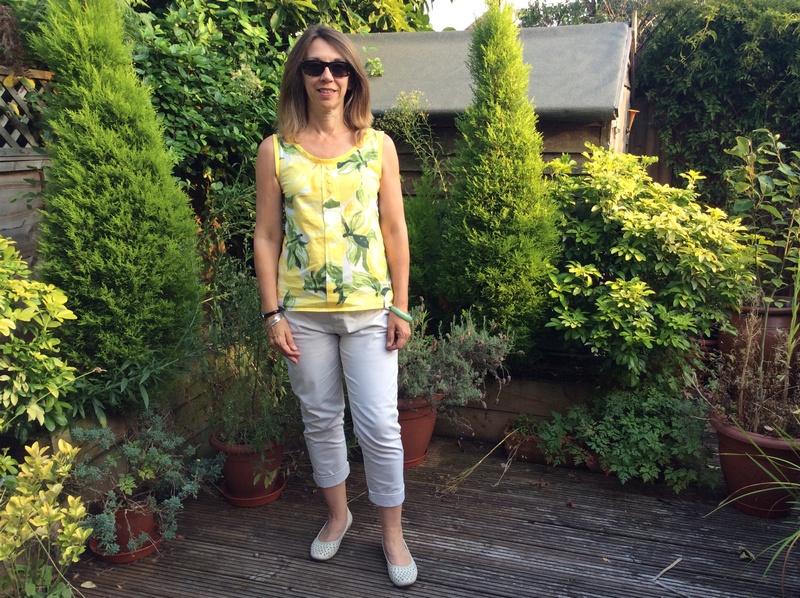 I really like this top – it feels summery and has had a lot of wear. This Sorbetto is made with lovely Liberty Lawn. The clever design means that it works equally well with the browns/creams and with the blues. Looking rather formal today as we had a meet the parents evening – this was taken just beforehand in Pizza Express. 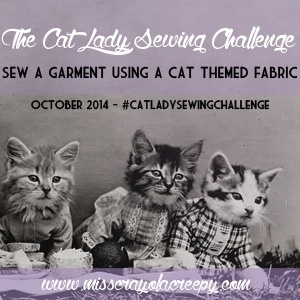 I am really enjoying looking at everyone’s makes during OWOP and have also explored Instagram and Pinterest. My first repeat during OWOP14. I am SO pleased I added an extra three inched to my later Sorbettos! Meet Tambo – 15 months old and incredibly handsome. 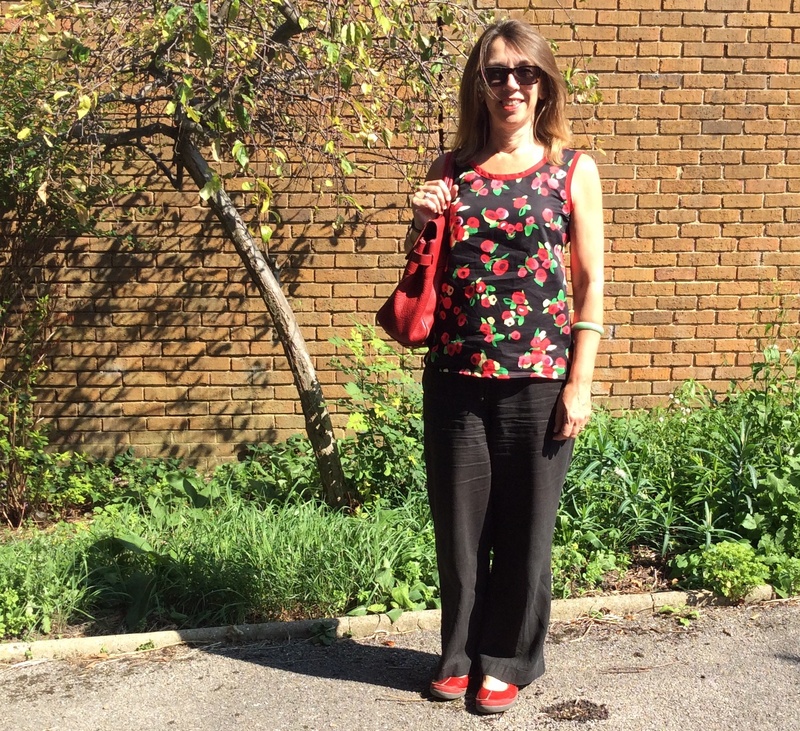 Today my Sorbetto is looking a bit more informal teamed with a pair or lightweight trousers. 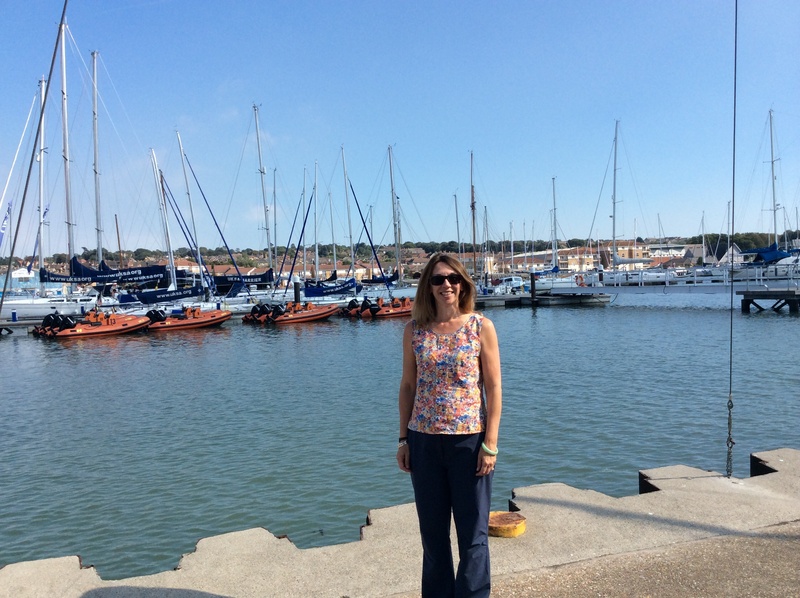 Here I am at Cowes, Isle of Wight for three days sailing with the new Y7 – the sun has shone on us all day and I am pleased to have participated in OWOP. The Sorbetto didn’t stay for long as I had to put on a wetsuit. And finally . . . . . The one that got away! Just look at this gorgeous silk I bought in China this summer – I had every intention of making one further Sorbetto for OWOP 14 but once the term started time just ran away. Maybe for next year . . .
How was your week? Find any patterns you are going to try as a result of being inspired by others? 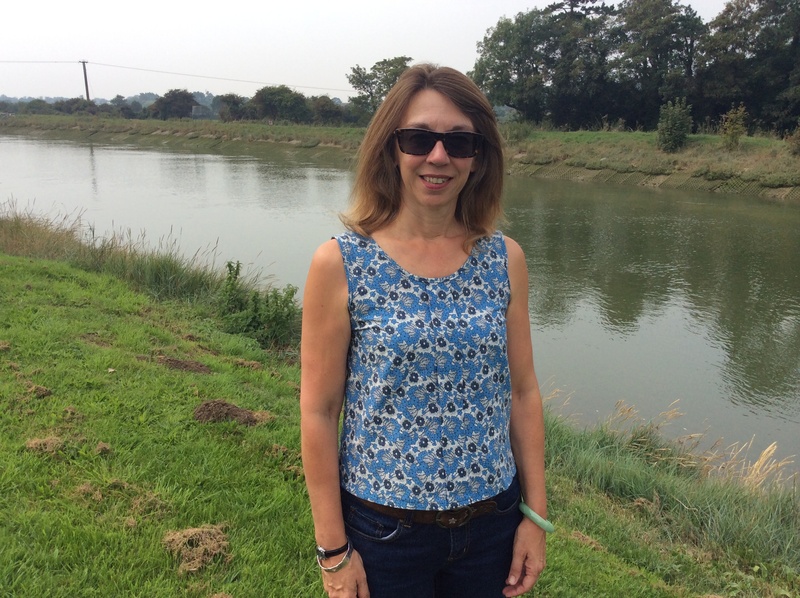 Today has been the first day of One Week One Pattern 14 and I am really looking forward to being involved in an event with the on-line sewing community. 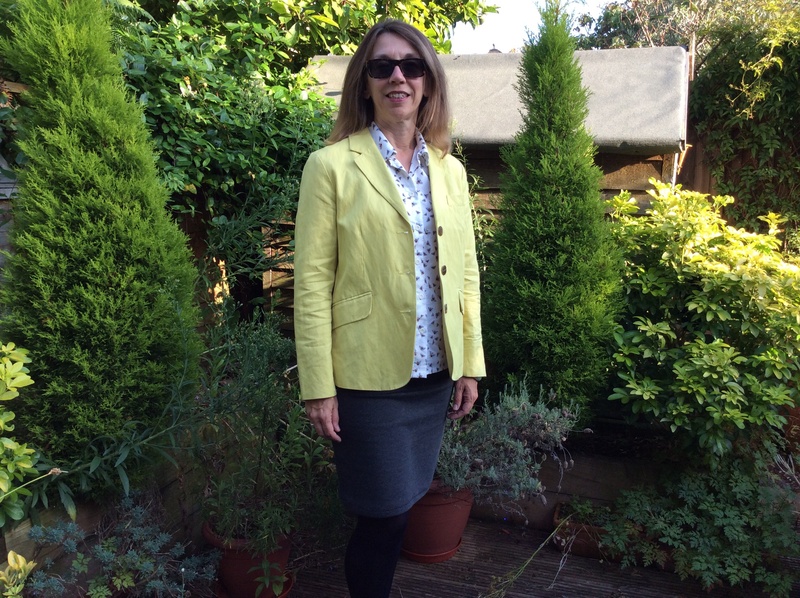 As I was putting on my Sorbetto and thinking about what I would say in my round up blog, I remembered that the fabric was left over from my Great British Sewing Bee – the work version so thought that I should do a catch up blog about that. Break time in my school is the only time of the day when we get ten minutes to sit and chat with our colleagues. We are a funny bunch and tend to sit with the same group of people. My particular chums were all huge fans of The Great British Sewing Bee and decided to run our own version. We chose the same pattern, asked the textiles teacher to be our judge and gave ourselves the May Half Term to complete our task. It was SO much fun. I had only bought my sewing machine at Easter, another Bee literally bought hers to take part in the sewing bee. We wore them all on the same day the first week back. Our judge had really thrown herself into the spirit of things making her own dress, devising a mark sheet with judging criteria. 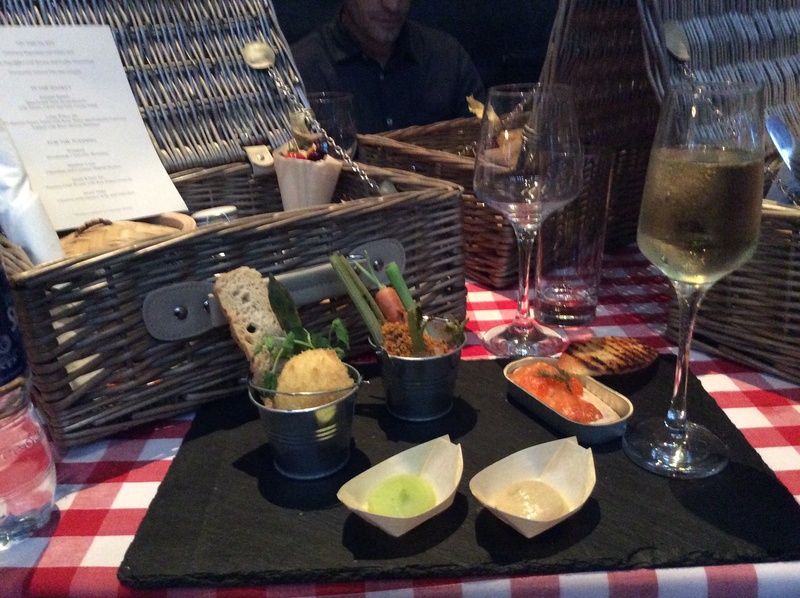 There was an overall winner and individual categories – which surprisingly each of us won one of. The report of our successes and short-comings were written up and appeared in the week’s school newsletter. 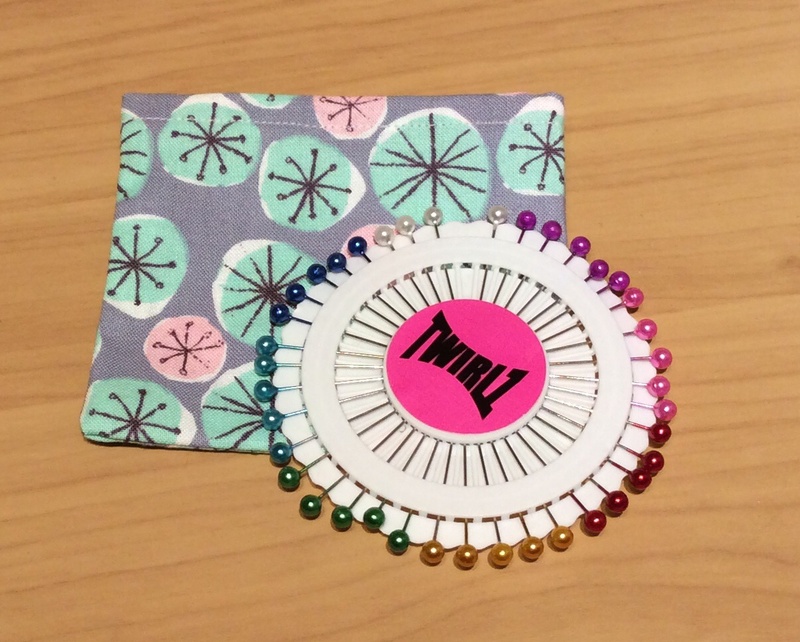 We were each given a prize – a pin wheel in a handsewn case made by our generous judge Heather in the material she had used for her own dress. 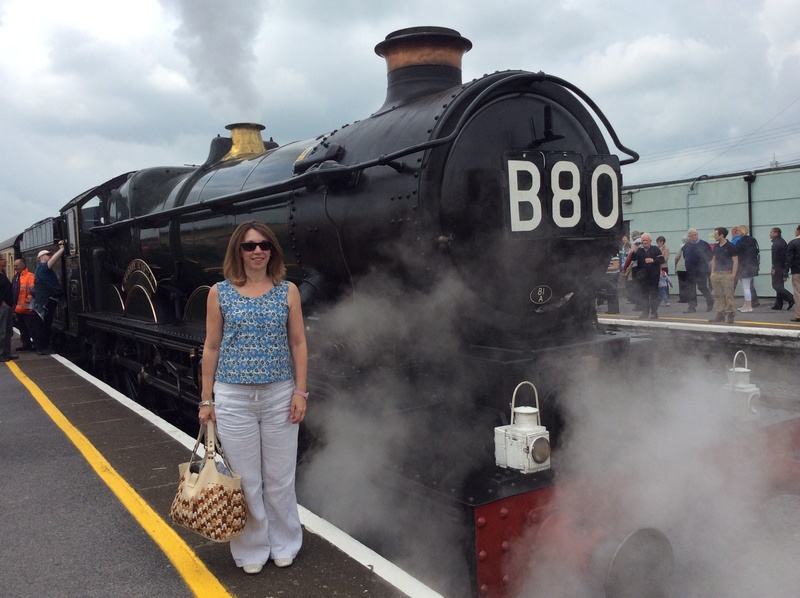 We enjoyed it so much it could become an annual event – what about you? 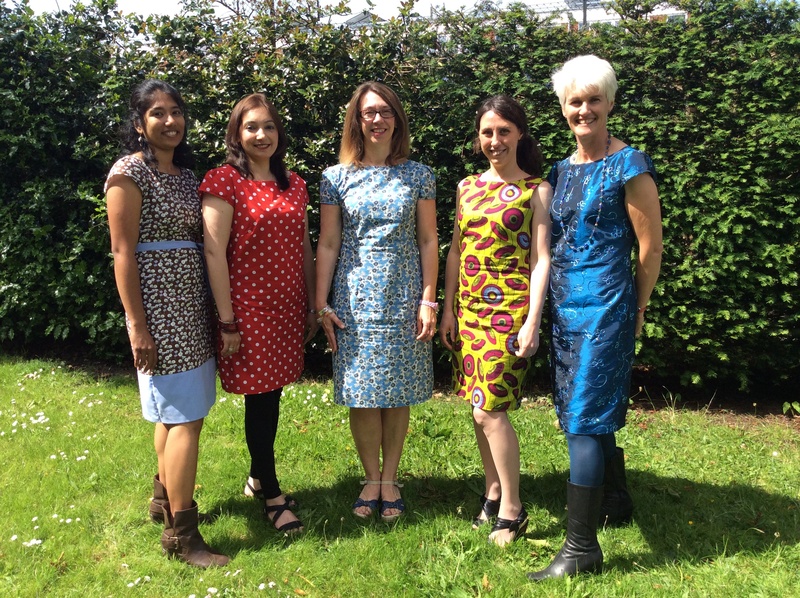 Could you run a sewing bee in your place of work?
. . . although not if you can see the waistband! 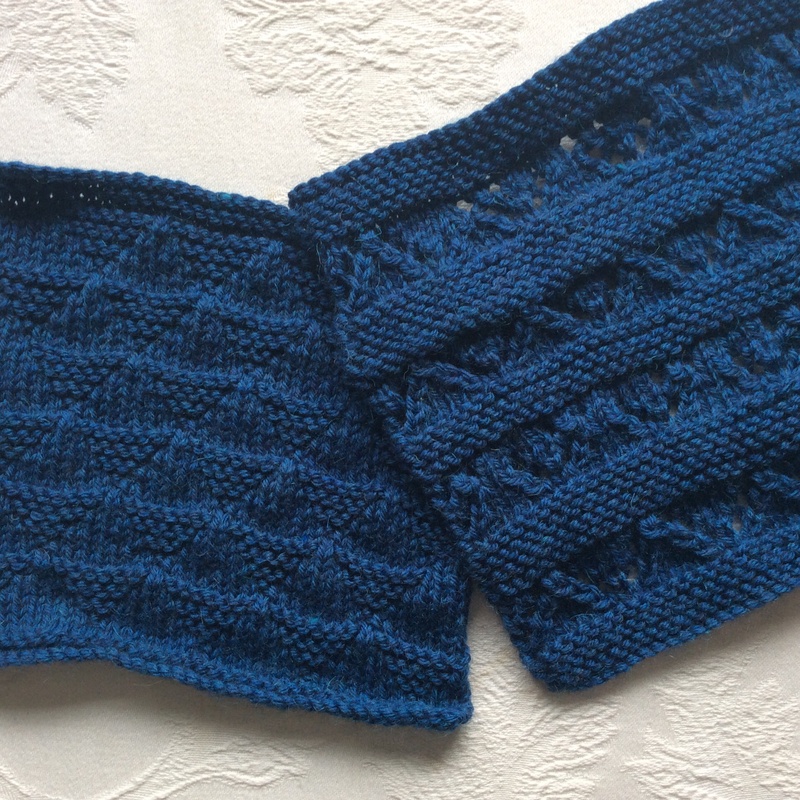 I really enjoyed a recent post from Sewn By Elizabeth where she shared her thoughts on a free pattern – a good idea for a number of reasons, not least of which is getting something for free. 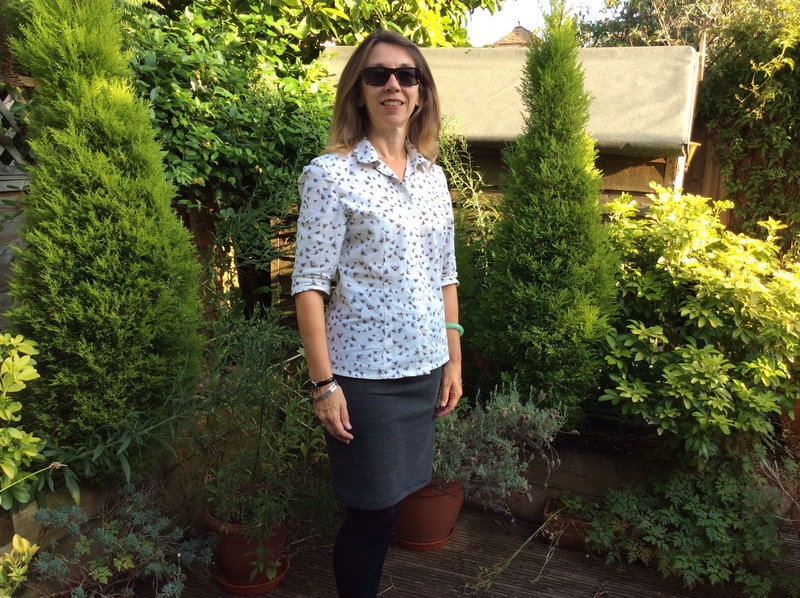 I found it hard to believe that she knocked up a fully lined skirt in half an hour but it really is a very straightforward make so three cheers for Sewloft Karina Skirt and for Elizabeth. This was my second ever knit piece and although I felt happier with the walking foot, twin needling has still eluded me. I bought the fabric on EBAY and initially thought I had a bargain for £5.99 but realise it was just an end of roll remnant and perhaps I had been less canny than I thought. 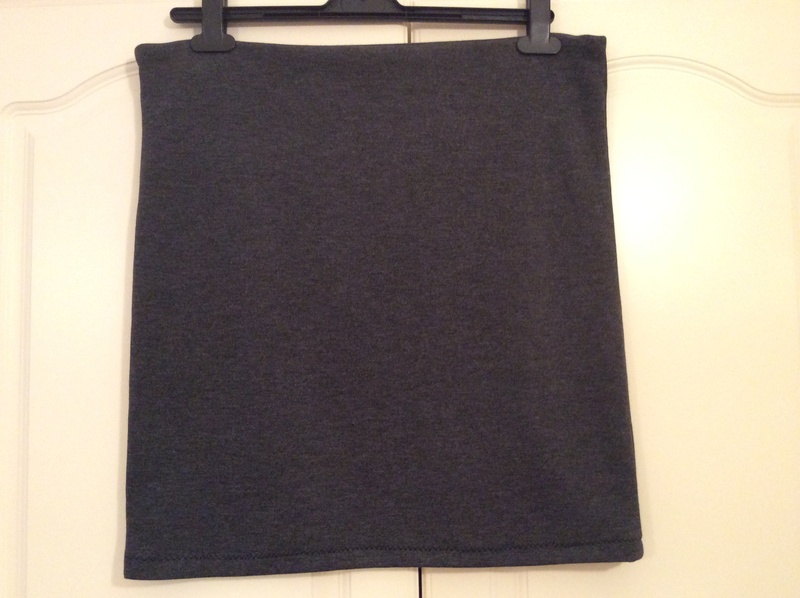 I cut a medium which sits fine on my hips but the waist seems huge – I know it has to be able to wiggle over my bottom but it then almost sits apart from like a hoopla hoop. I suspect I have completely misunderstood the elastic instructions. It looks fine with a shirt on the outside but I would prefer a more snug fit around the waist. I was slightly anxious that it might actually wriggle itself down but my sturdy backside held it in place. So, today was Back to School for the students although we have been there since Monday. 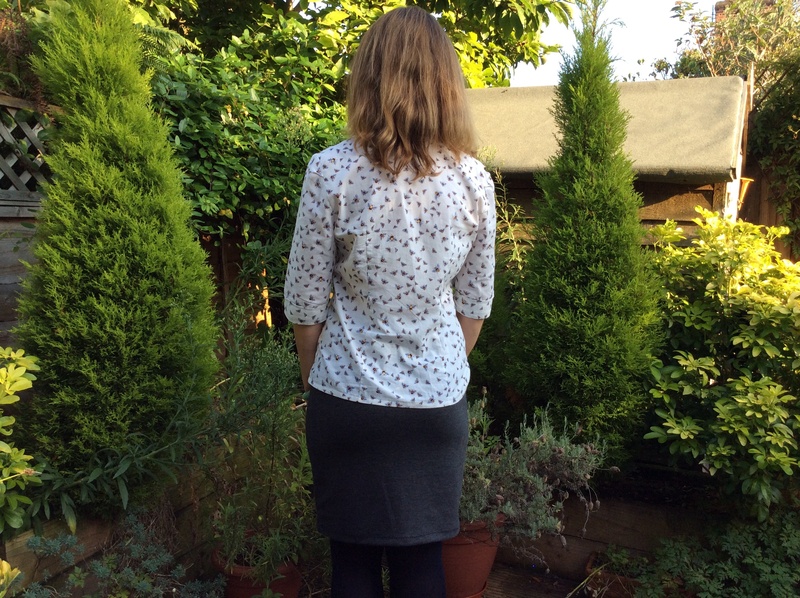 The whole time was spent with my new form and I wanted to convey an air of authority – hence the choice of my grey skirt but with the hint that I might actually have a fun side by teaming it with my Bees shirt. Do you think this outfit would have achieved my aim? Really looking forward to One Week One Pattern – still don’t know how to get an icon or post on Pinterest so any advice gratefully received.